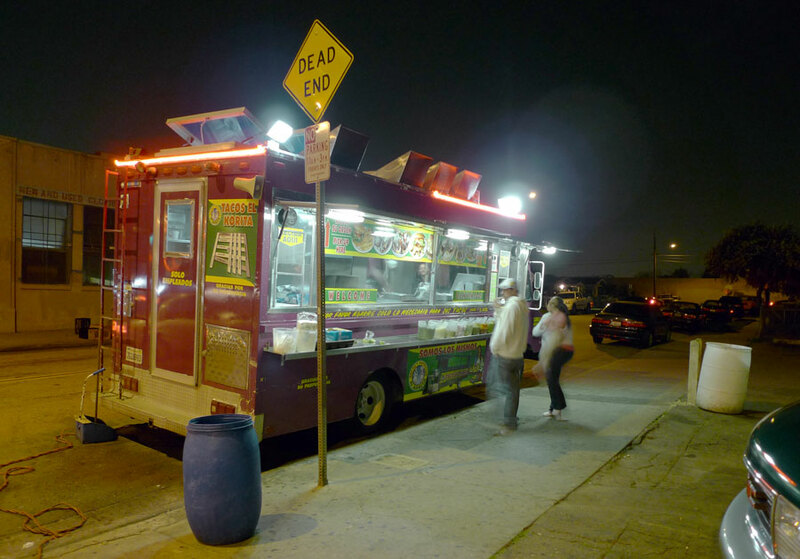 Taking advantage of a pleasant evening, I stopped off at another great East Los Angeles taco truck on my way home from work. The Tacos El Korita truck was another that had a good reputation on the interwebs, and I knew to expect fine handmade tortillas. I was not disappointed. The tortillas have that quality I have termed leathery – resilient and slightly denty to the tooth, the tortillas soak up some taco juices without saturating or getting clammy, and have a good finger feeling as you hold them in your hand. I ordered three tacos for $1.25 each – carne asada, al pastor, and carnitas. They were somewhat above average in size, and perfectly proportioned. They came on the plate sans salsa, cilantro and raw onions, but with that beautiful pile of grilled onions instead; a full compliment of salsas and toppings was available on the stainless steel countertop. The picture shows my handiwork prior to scooping the grilled onions on top. These were all superdelicious. 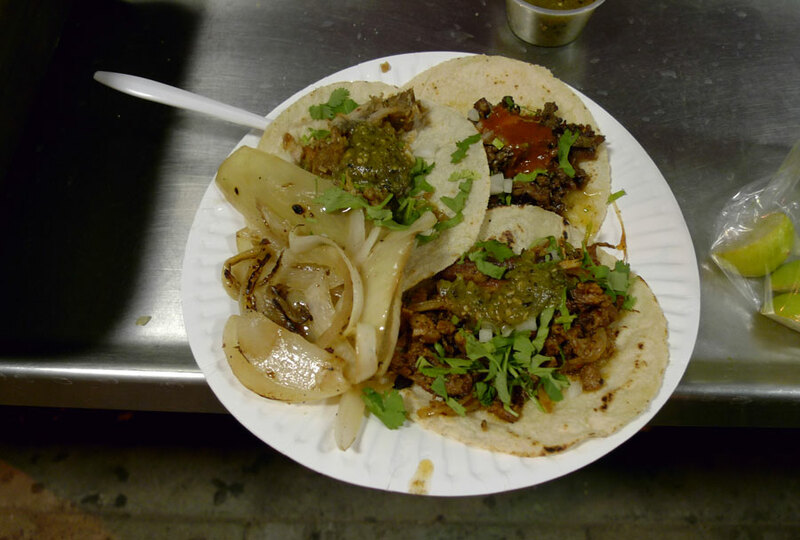 I ate the al pastor first, and this is what I would consider a classic al pastor – the flavor is very potent, and it’s reminiscent of the pastor at a truck from which I’ve eaten dozens of times, the Cemitas Poblanas truck on Venice near Clarington in front of Smart and Final. The fine, leathery tortillas and grilled onions made a superior taco. Next I ate carnitas. Finally, I have found delicious carnitas at a taco shop! The meat was a rich brown instead of the stringy grey stewy meat one frequently encounters, and it had the delightful combination of textures that good carnitas provides – crunchy bits, tender mouth-melting bits, chewy bits. The bits were good-sized chunks, and some of them give you that enjoyable feedback you get when you bite into something chewy like a caramel. And also, it tasted very good. Then I ate carne asada. The meat was very dark and, I dare say it, sweet and flavorful, varied in texture, reminding me a bit of beef jerky in the best possible way. Each of these tacos was so good that I can pick no favorite. When I return to El Korita for another deeply moving $3.75 meal, I will again order one of each of carnitas, al pastor, and carne asada.